Active - 1931 - 1983 | Born - Aug 30, 1896 in Toronto, Ontario, Canada | Died - Jul 29, 1983 in Los Angeles, CA | Genres - Drama, Adventure, Historical Film, War, Western | Height: 6' 3"
As one of several sons of the owner of Toronto's Massey/Harris Agricultural Implement Company, Raymond Massey was expected to distinguish himself in business or politics or both (indeed, one of Raymond's brothers, Vincent Massey, later became Governor General of Canada). But after graduating form Oxford University, Massey defied his family's wishes and became an actor. He made his first stage appearance in a British production of Eugene O'Neill's In the Zone in 1922. By 1930, Massey was firmly established as one of the finest classical actors on the British stage; that same year he came to Broadway to play the title role in Hamlet. In 1931, Massey starred in his first talking picture, The Speckled Band, portraying Sherlock Holmes. One year later, he was co-starred with Charles Laughton, Melvyn Douglas, Gloria Stuart and Ernst Thesiger in his first Hollywood film, the classic The Old Dark House (1932). Returning to England, Massey continued dividing his time between stage and screen, offering excellent performances in such major motion-picture efforts as The Scarlet Pimpernal (1935) and Things to Come (1936). In 1938, he was cast in his most famous role: Abraham Lincoln, in Robert E. Sherwood's Pulitzer Prize-winning Broadway production Abe Lincoln in Illinois. Massey repeated his Lincoln characterization in the 1940 film version of the Sherwood play, and 22 years later played a cameo as Honest Abe in How the West Was Won (1962). 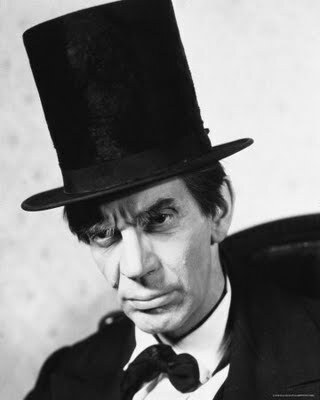 Refusing to allow himself to be pigeonholed as Lincoln, Massey played the controversial abolitionist John Brown in both Santa Fe Trail (1940) and Seven Angry Men (1955), and gave an effectively straight-faced comic performance as mass murderer Jonathan Brewster (a role originally written for Boris Karloff) in Frank Capra's riotous 1941 filmization of Arsenic And Old Lace. Though he would portray a wisecracking AWOL Canadian soldier in 1941's 49th Parallel and a steely-eyed Nazi officer in 1943's Desperate Journey, Massey served valiantly in the Canadian Army in both World Wars. On television, Massey played "Anton the Spymaster", the host of the 1955 syndicated anthology I Spy; and, more memorably, portrayed Dr. Gillespie in the 1960s weekly Dr. Kildare. An inveterate raconteur, Massey wrote two witty autobiographies, When I Was Young and A Thousand Lives (neither of which hinted at his legendary on-set contentiousness). Married three times, Raymond Massey was the father of actors Daniel and Anne Massey. Massey said the British thought he was American and the Americans thought he was British. He was actually Canadian. But his mother and paternal grandmother were both Americans and his branch of the Massey family migrated from England to Canada via the United States. Played Abraham Lincoln a total of four times; once on TV, twice in the movies, as well as in the stage play "Abe Lincoln in Illinois.". Massey portrayed Abraham Lincoln in the 1950s "Du Pont Show of the Month" television drama "The Day That Lincoln Was Shot", opposite Lillian Gish as Mary Todd Lincoln, in the films Abe Lincoln in Illinois (1940), and How the West Was Won (1962). Was a two-time Wound Badge winner, having been wounded in both world wars. Died the same day as his The Prisoner of Zenda (1937) and Stairway to Heaven (1946) co-star David Niven.